SCENTS: While it is nearly impossible to disuise the human scent, masking scents can confuse deer and give you enough time to take a shot. Masking scents include fox urine, skunk musk, and fresh cedar leaves. 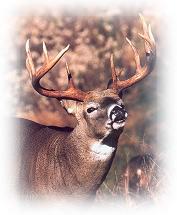 You should use scents familiar to the deer in your hunting area. You should apply masking scents to your clothing and boots, and to the vegetation near your stand. Attractant scents are effective because they take advantage of a deer's inclination to investigate any urine smell he notices. Doe-in-estrus scent is the most commonly used attractant and is intended to attract bucks who are in rut. Many hunters sometimes will put scent canisters near their stand and make scrapes by clearing away some grass and leaves beneath an overhanging branch. Doe-in-estrus scent is then applied into the faked scrapes to attract bucks.